Experimenting a unique swim with dolphins in Cancun is something you have to do at least once in your life, however our recommendation is to carefully choose the location, the kind of interaction and also your companion. The best swim with dolphins’ experience is made by you, your disposition to learn about the marine ecosystem, how incredible the dolphins are and your respect for this activity in every moment. Here we’ll help you to build the perfect moment, discover how. When deciding to live this experience, the question is: where to swim with dolphins in Cancun? This is a decision that can define the quality of your experience, this is why we always recommend to choose a natural habitat. Among the best, we recommend the following: Xel-há, Xcaret, Hyatt Zivá and the last, a favorite; Puerto Morelos. Imagine living this moment surrounded by the Caribbean Sea and the Mayan jungle, it will be something memorable. How to choose the right swim with dolphins in Cancun? Interactions in every habitat: check the kinds of interactions there are in the habitat of your selection, not every place offers the same, that’s why it is very important to know this beforehand. Who you are going to live the interaction with? : fortunately, you can pick the ideal interaction depending on who you are going to do it with. Here are some examples that will help you to take the best decision. We recommend Primax 4 (4 people), Primax ( 6 people), Trainer for a day (6 people), Delphinus Trek ( 8 people), Interax (10 people), Dolphin Ride (10 people) and Splash ( 10 people). For you and your partner, there is the Couples interaction. The two of you will share a unique, intimate experience with dolphins. It is very important that kids become more aware of the world that surrounds them, it is important for them to learn and know about their role in taking care of the environment, that is why there is an interaction especially for them: Dolphin Kid! This is the most exclusive and personalized interaction, with free transportation included just for one, the best experience only for you: The One. As you can see, once you choose the habitat and the ideal interaction for you, you just have to follow the instructions of the Specialist Animal Care to ensure you and the dolphins spend an incredible moment. 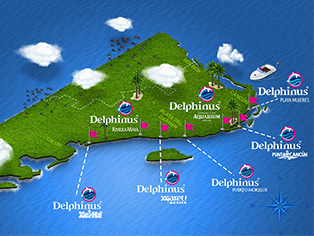 Do not forget to plan your experience by booking with time and knowing the tips about our habitats, as well as all you need to know before swimming with dolphins. Now you are ready! Make your swim with dolphins in Cancun a perfect moment, what are you waiting for to tell everybody about your unique experience during your vacations? Take advantage of the season’s discounts and interact with the most intelligent marine mammal of the ocean. For a brilliant blue planet!